Shares of Funko (NASDAQ:FNKO) gained 31.9% in January, according to data from S&P Global Market Intelligence. The pop-culture-merchandise company’s stock rose thanks to a rebound for the broader market and encouraging holiday sales data. Encouraging holiday sales data started to trickle in at the end of December and continued to arrive in January. Tracking suggested that overall holiday 2018 retail spending was near record levels, and reports of strong toy sales from retailers including Target and GameStop likely also helped buoy the stock. While there wasn’t any new, company-specific sales data to parse in January, strong holiday spending reports boded well for Funko’s performance and added to the stock’s momentum as the broader market bounced back from big sell-offs. 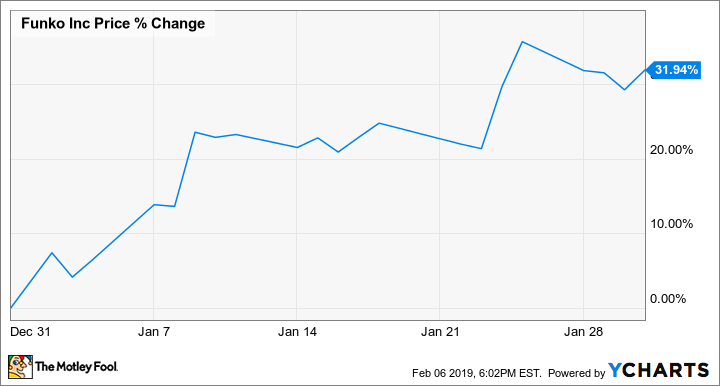 Funko stock still gained 98% across 2018, but shares lost roughly 38% of their value from October through December as the broader market experienced volatility and concerns about the company’s shrinking gross margins weighed on its outlook. Funko went public in November 2017, pricing its stock at $12 per share, and the company’s valuation has seen wild swings as investors have attempted to weigh the business’s strong sales growth and impressive licensing relationships against the possibility that long-term performance will be difficult to predict. The big question for Funko shareholders is whether the company will be able to build a sustainable business on the foundation of its pop-culture figurines, or whether its fast-growing Pop! dolls will wind up being a fad and leave the company without a growth engine. Keith Noonan has no position in any of the stocks mentioned. The Motley Fool owns shares of GameStop and has the following options: short July 2019 $18 calls on GameStop. The Motley Fool has a disclosure policy. Previous articleAltria Touts Juul's Sales of $1 Billion. Is That As Good As It Gets?